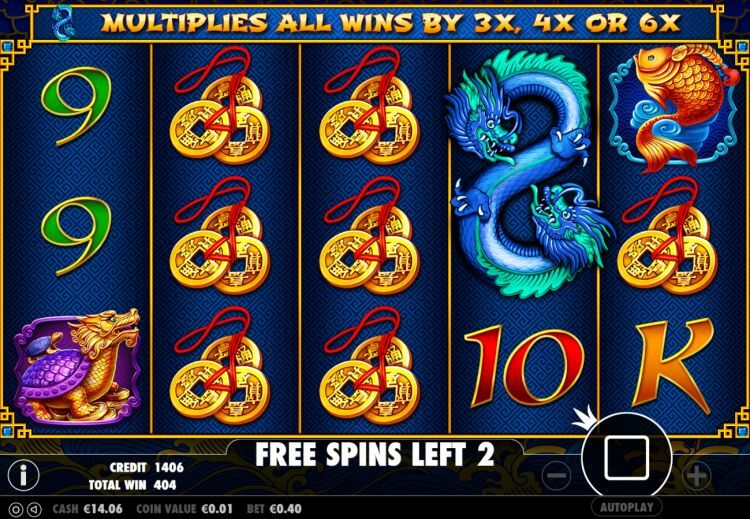 8 Dragons is a gorgeous online slot by Pragmatic Play that is full of the things that makes gambling so much fun: wilds, free spins and multipliers up to 15 x. And of course, dragons, scary, fire-breathing dragons. As you perhaps already know, the number 8 is considered a lucky number in China. And let’s be honest, a little extra luck is always welcome. That is the reason why many slots with an Eastern theme have the number 8 in the title and also why many bookies and casinos have it in their name. In this slot, the main focus is on the Wild dragons. The dragons not only breathe fire, but they also get you extra multipliers. When a whole dragon appears on the screen, it will give you a 2 x multiplier on all your winnings in the primary game. But if you see the same scenario play out in the free spin bonus, then the party starts. You will now be playing with an extra multiplier that can go up to 15 x. Hot dayum! What is the payout rate and the variance of the 8 Dragons slot? This slot has a solid payout rate of 96.37%, and that is nothing to be ashamed of. But make no mistake, this slot is not for the faint of heart. The variance is high, and that has everything to do with those high maximum multipliers. In the bonus game, those will allow you to get your hands on some seriously big money, but that causes a certain amount of capriciousness. Fortunately, the bonus game does occur frequently, so you will feel that adrenaline boost regularly, either to tease or reward. How does the 8 Dragons slot work? 8 Dragons has 5 reels with 3 symbols per reel. The symbols look incredible, and they are a mix of typical Oriental images and the all too familiar card symbols 9, 10, J, Q, K, and A. The tigers, gold nuggets, koi and dragons are so colourful; they just leap off the screen. There are 20 fixed paylines, and the betting ranges from a minimum $€ 0.20 to a maximum of $€ 100, per spin. The tiger is the most valuable: it will pay out 500 coins with 5-of-a-kind on an active payline. The other premium symbols are a step down from that: between 70 and 130 coins when hitting 5 the same. The lowest value symbols are at the 30 to 40 coins level, again when obtaining that all important 5 identical ones on the active payline. All symbols appear in (mini) stacks, so it will frequently occur that you have a screen that is (almost) filled with the same symbols. The dragon is wild and replaces all other symbols, except the scatter, which is a red envelope. When a dragon appears on the screen entirely and is a part of a winning combination, you receive a 2 x multiplier on all prizes. The bonus of Pragmatic Play: free spins with multipliers up to 15 x! As soon as 3 or more scattered red envelopes appear on the screen, the free spin bonus is activated. The mystery free spins choice is very interesting. It is possible to win 20 free spins with the highest multipliers of 8 x, 10 x or 15 x. But it takes guts to go for it, for the same money you end up with 5 free spins and the lowest multipliers. The free spins can be retriggered endlessly during the free spins. Because of the dragon wild multipliers, that can go right up to 15 x; this bonus has enormous potential. With high potential, however, comes a high unpredictability. We have received payouts of 500 x the bet, but we also had bonuses that paid out as low as 10 x or 20 x the wager. 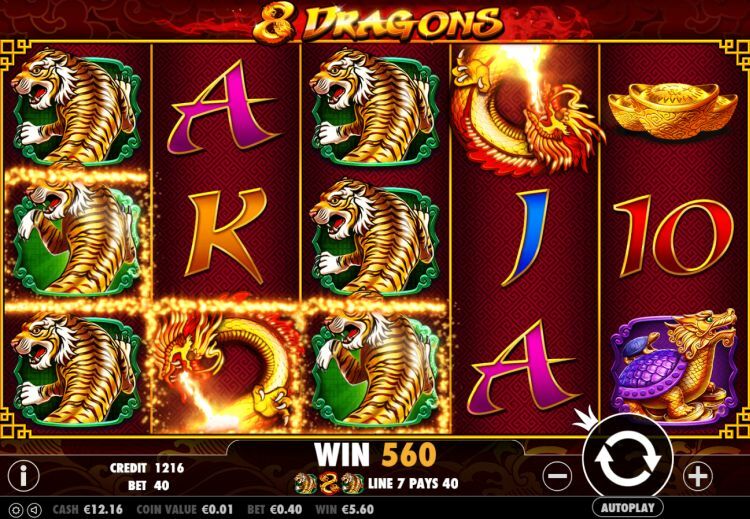 Our verdict on the 8 Dragons video slot? We can be brief here. 8 Dragons is an incredible slot by Pragmatic Play. Stronger still, we just can’t get enough of it. Visually this slot is top of the line, the game is fast, and the bonuses can be incredibly lucrative. Another plus: the free spin bonus drops very regularly, and the same is true for the retriggers. 8 Dragons gets a splendid rapport card from us, and the score reflects this! Where can you find 8 Dragons? 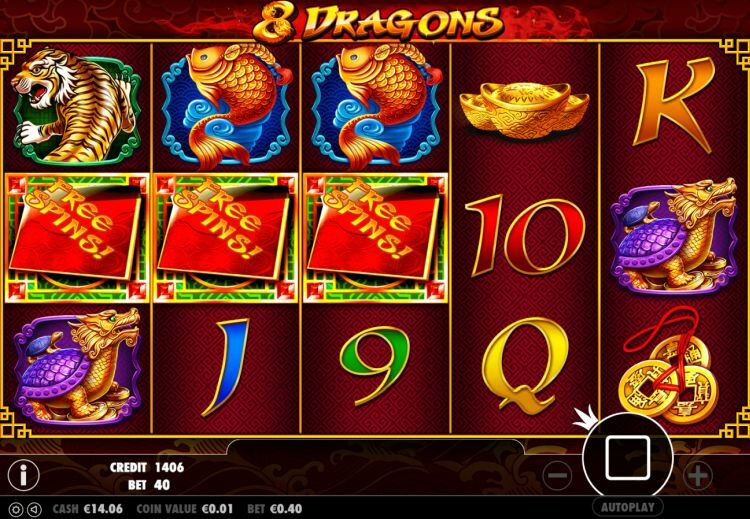 The 8 Dragons slot is found at all reliable Pragmatic Play casinos. One of these Pragmatic Play casinos is Casumo, which is one of our favourite online casinos. 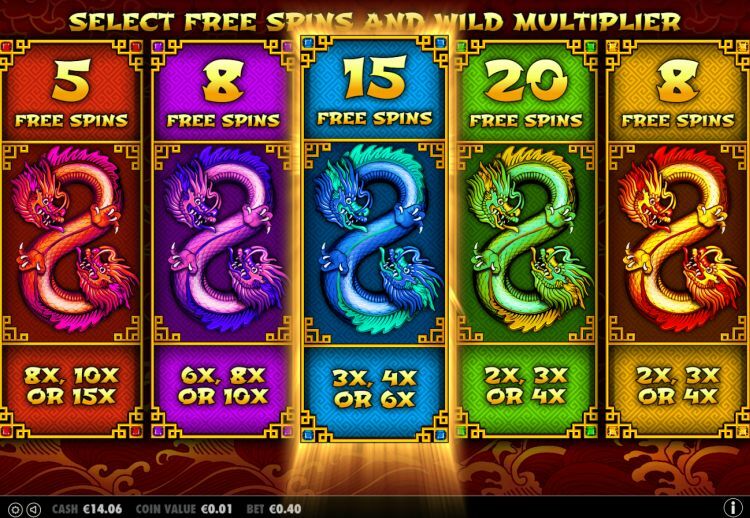 You can play the 8 Dragons slot at Casumo with a 200% bonus up to $€50 plus 200 free spins.